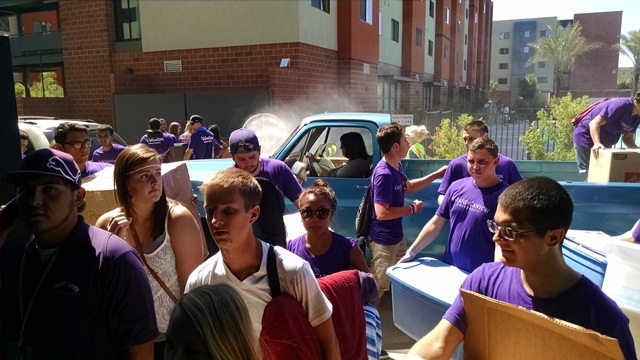 Nearly 1,300 purple-clad volunteers lined campus roads Wednesday to welcome new GCU students. You couldn’t have asked for a better morning to introduce the first of 6,203 students — who this week are moving into 11 residence halls on Grand Canyon University’s main campus — to their new homes. Wednesday’s weather — crystal clear skies but for a dotting of lavender and golden sun-kissed clouds in the east and cool temperatures the likes of which have not been seen on this date since 1995 — was a God thing. At 6:30 a.m., as the first of hundreds of vehicles carrying excited students and parents suppressing lumps in their throats was unloaded, the mercury edged 75 degrees. 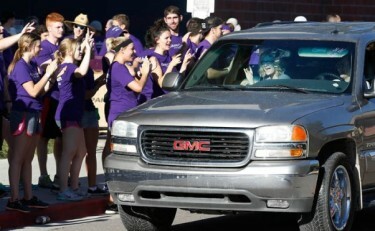 The passenger in this vehicle knew the secret password for admittance into GCU: Lopes Up! It felt like … 75 degrees. “God showed up in a big way,” said Pastor Dean of Students Tim Griffin, referring to the climate, atmospheric and campus-wide. 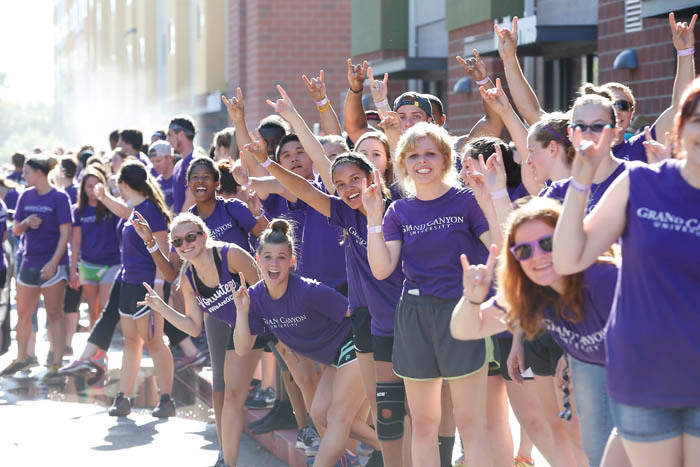 The first of a three-day Move-In, GCU’s mega-purple, super-loud, off-the-charts welcome wagon for new students, was driven by nearly 1,300 volunteers – staff, spiritual life leaders, ASGCU leaders, residential assistant leaders and a student welcome crew of 425. The student army asked to be on the front lines, cheering, unloading and hauling boxes, bags, mirrors, televisions and other items from the vehicles, up multiple flights of stairs and into dorm rooms. Many of them moved onto campus and were trained on Tuesday night. This is how we do it, Griffin said. It wasn’t quite a case of “Which came first, the chicken or the egg?” But the question of which car was numero uno at GCU’s version of dawn patrol was a matter of Move-In semantics. First in line in the semi-darkness of 5:45 a.m. was Mark LePard, who was bringing in his son Pablo from Wildomar, Calif. They were staying in Scottsdale and thought they would hit traffic, but Mark said he hit just about every light on the way over and cruised right in. 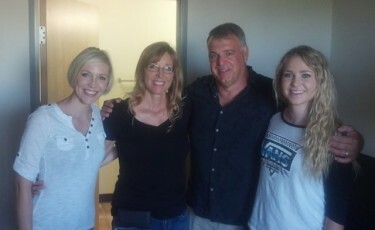 The Provenzano family (from left), Colleen Ayoub and Eileen, Lou and Breana, enjoyed the Move-In experience at Chaparral Hall. But the first vehicle to get gang-tackled by a luggage-lugging crew at Chaparral Hall, led by College of Business Dean Dr. Randy Gibb, was driven by Lou Provenzano of Surprise, whose daughter Breana is a freshman in the College of Nursing and Health Care Professions. Along with his wife, Eileen, and Breana’s sister, Colleen Ayoub, Lou watched in amazement as the truck was emptied in about a minute. Eileen said Breana was considering Northern Arizona University but chose GCU because of its nursing program and the attention the family was given during enrollment. Part of the process of move-in is rearranging the room, and it was amusing to hear Lou drop one-liners as Breana, her mom, her sister and her new roommate tested various forms of feng shui with the arrangement of the beds, desks and dressers. It might have been the only part of Move-In that wasn’t quick. 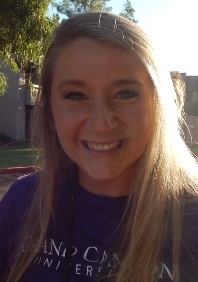 Freshman Ashley Vest helped move her classmates into Chaparral Hall. Among the dozens of ebullient students stationed outside Camelback Hall, where a huge fan oscillated great clouds of cool mist, was Ashley Vest. The 18-year-old freshman arrived on campus at 5:45 a.m. to help move in her peers in the Class of 2018. As a member of the GCU dance team, Vest has lived in Saguaro Hall since early August — plenty of time to get to know her way around. Dr. Anne McNamara, dean of the College of Nursing and Health Care Professions and a regular at Move-In, donned a violet-colored cowgirl hat to shade her eyes from the sun that rose above Camelback Hall shortly before 8 a.m. She was in just the right place to greet one of her new students, Hector Ornelas Jr. of Stockton, Calif. The 18-year-old rode in with his parents, Hector Sr. and Fabiola, and sister Ruby, 8 (a future Lope?). The back of the family’s truck was unloaded in 30 seconds — flat. “This is amazing,” the father said. Students and volunteers flooded the campus roads outside Saguaro Hall early Wednesday. Brandon Clarke said he’d never seen such a sea of humanity. As more than 600 students and their families flooded the lobby of Saguaro Hall, the brand-new GCU resident director was quick to offer assistance to visiting parents and incoming students. 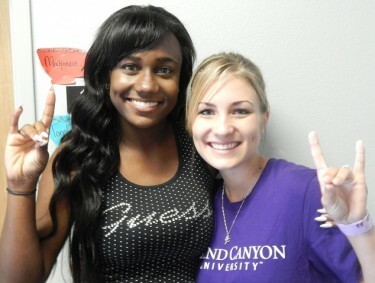 “This is my third day,” said Clarke, who joined GCU last week. Clarke and Corinne Webb are assigned as RDs at Saguaro Hall, a co-ed freshman dorm that opened last fall. Billy Thrall was more than happy to point people in the right direction. It became apparent early on that senior Cole McClary’s forced (because of shoulder surgery two weeks ago) one-armed direction of traffic in front of Chaparral Hall was not going to work. Arm braces have a way of being immobilizing. Around Saguaro Hall and in the pathways outside, many parents were torn between focusing on the logistical obligations of the day and trying to manage their emotions. For Monica Cornelius, the first day of Move-In meant saying goodbye to two sons. Zachary, a freshman Saguaro resident, was joined by his brother, sophomore Joshua, who transferred to GCU the same year as his younger brother started. Monica and her husband, Mike, drove the boys from their hometown of Yorba Linda, Calif. on Tuesday to be prepared for the double Move-In experience the next day. The couple said everything with the “Luggage Luggers” — GCU’s yeoman suitcase carriers — seemed to go smoothly, helping ease the transition at hand. “I think I was going to be much sadder at the thought of it, but seeing how much fun they’re going to have here makes me feel better,” she said. Tondalaya Smith and Cheri Luikart became friends at Move-In. Cheri Luikart, a sophomore life leader on the first floor of Camelback, wasted no time in introducing herself to freshman Tondalaya Smith of Fairfield, Calif. No sooner had Smith’s belongings been transferred from the U-Haul van that her uncle, Benjamin Thomas of Phoenix, insisted on renting, to her room than Luikart popped in. Smith, a cousin of GCU basketball star Jerome Garrison, chose GCU over UCLA, which seemd “big and out of control.” Pretty good decision: Her room has a lovely view and is near the laundry room. The tallest member of the student welcoming committee at Chaparral was 6-foot-11 Tobe Okafor, a new member of the GCU basketball team. And he didn’t even have to be there. He has been on campus all summer for team practices, but he just wanted a taste of what Move-In is like before he actually gets to carry boxes upstairs. 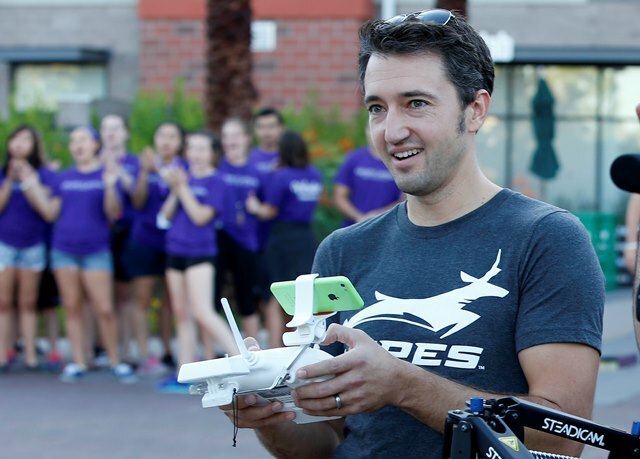 Steven Niedzielski sends the drone on its merry way to take more photos of Move-In activities. Drones aren’t the wave of photography’s future anymore — they’re the present. And GCU’s marketing department was right in step Wednesday morning with getting a top-down view of the festivities. Videographer Steven Niedzielski had the device flying all around until the battery started to give out, and then he still was able to use it as he rode on the back of a truck pulling into Camelback Hall. The drone has a gyro-stabilized camera and can go as high as 450 feet. Maybe he should have asked Tobe Okafor. By now, GCU’s Public Safety office has become familiar with securing Move-In Week, but this year there’s more manpower. 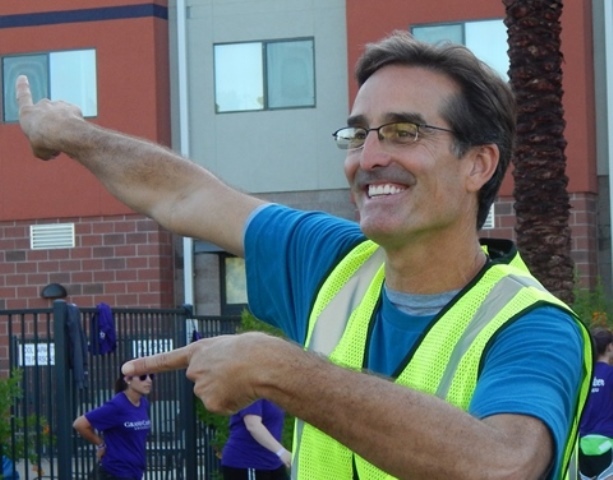 After a major hiring push this summer, GCU has more than 100 security staff on campus. On Wednesday morning, GCU officers were joined by several Phoenix Police officers — many on bicycles — to provide more than 50 security personnel for incoming students, families and staff. Laird added that increased training for GCU officers, and joint operations with Phoenix Police, have helped increase campus safety as the University evolves and expands its boundaries in west Phoenix. It says something when someone who does this sort of thing for a living heaps praise on the efficiency of Move-In. Suzy Wapnick of Windsor, Colo., who brought her son Jacob to Chaparral, is an event coordinator for Centennial Ag Supply in Yuma, Colo., often organizing barbeques for 750 people.